The English department at ACU believes in the importance of reading, reasoning, and writing effectively in order to serve God in an information-driven world. Shakespeare’s sonnets often strike students as overly complex and difficult on first reading, but breaking them down into smaller parts can make the process of interpreting them easier. How can you break longer poems down into stanzas, verse paragraphs, or sentences? Do these sections move logically from one to the next? Does the poet use basic poetic units like the couplet, quatrain, sestet, or octave (2, 4, 6, or 8 lines) to develop a single image or cluster of related images? Listen to the following close reading of Shakespeare’s Sonnet 12 before moving on to complete the explication exercise below. Step 1. Choose one of the assigned poems and read it once or twice aloud. Since lyric poetry shares a close relationship with music, reading your poem out loud will draw your attention to rhythms and sound effects the poet may be using to develop his ideas. Step 2. Next paraphrase the poem (or for longer poems a short section of it) in your reading notebook by translating its meaning into contemporary speech. Step 3. Looking at the poem as a drama, who are the characters? (What do you know about the speaker? Who is the audience or listener?) What is the central conflict? What implied action(s) occurs before, during, or after the poem? *Remember that the “I” of the poem is often a dramatic persona and not necessarily the poet himself. Step 4. Looking at the poem as an argument or debate, what is the speaker’s rhetorical purpose or goal? What arguments does he use to persuade his audience? What strategies does he use to make these more persuasive? How is the structure of the argument reflected in the structure of the poem? Step 5. Now look at the structural and poetic elements of the poem. How does the poet divide the poem into logical parts? How does spacing or punctuation make these logical divisions clear? How does the poet use image patterns or conceits to develop a theme or support an argument? Step 6. Look up any unfamiliar words in a dictionary. How does the poet employ difficult, unusual, or related types of words to develop an image or set the mood of the poem? Do they help set a tone that is personal, playful, academic, provocative, devotional, or something else? Step 7. Once you have a clear idea of what the poet is trying to say, organize your thoughts into an outline for a 5-minute audio explication. This doesn’t have to be a formal essay, but you should support main points by referencing key lines or phrases (by line number) that help listeners follow along in the poem. Do you believe there are limits to what human beings can or should know? Before class, make a list of subject areas on the frontier of scientific exploration. You may list either broad subjects studied by scientists (molecular biology) or particular areas of cutting-edge research (nanotechnology). Now choose 1 or 2 of the items on your list and search Google News for articles describing recent work in this specific or general area of research. Quickly skim the headlines and lead paragraphs of your first 5-10 results. In our own age of discovery, what attitudes toward science or scientific research are represented by these articles? Consider not only the tone of each but its source. Do you find stories describing the responses of politicians, church leaders, journalists, or scientists themselves? Why do these authors find particular areas of research fascinating, threatening, or something in between? Before class, spend a few minutes reviewing the Exchanging Vows timeline. 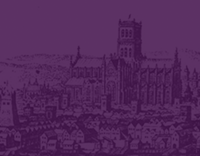 This interactive timeline will introduce you to important bonds that were formed or broken during the sixteenth century together with their lasting influence on England’s religious heritage. Taking notes as you review the reigns of each monarch may help you keep the important names and dates straight. Once you’ve viewed the Exchanging Vows introductory film, explore the Dipity timeline below. Remember that we’ll be talking about the first two class podcasts this Friday. Here are the files you can listen to at your leisure, but do jot down a couple questions to bring with you OR you can simply add your questions as comments to this thread. Thanks to our first two groups for diving into a strange, new assignment. I look forward to hearing responses to their work. The Middle Ages has often been seen as a transitional period between the golden age of ancient Rome and the rebirth, or renaissance, of learning and the arts in Europe in the 15th or 16th century. However, as we encounter smart, witty writers from Chaucer to Margery Kempe, you’ll begin to understand what a lively period the “The Dark Ages” really was. Before next Monday, go ahead and post your second blog post to the Blog Post #2 thread. Feel free to respond to either 15 minutes research on the Mapping Margery Kempe site described in the Margery Then & Now post OR to the Margery Live interview also linked below. Leave a comment to this post if you have questions. **Finally, just to make sure everyone is posting okay now, if you had trouble adding your Blog Post #1 this weekend I think I’ve found the problem. Please go back and add that post to the Blog Post #1 thread so we’ll have everyone’s work on file. Thanks. This site maps the intersections of religious belief and social attitudes represented by The Book of Margery Kempe through examples of the material culture of fifteenth-century England. Spend 15-20 minutes exploring images which investigate the place of the Parish Church, the Cathedral, Devotional Images, and Pilgrimage in the life of a medieval believer. How do these images help illustrate or challenge your idea of Catholic Christianity in the century before the Reformation? The site also includes an Outline of Kempe’s text with a detailed Glossary of unfamiliar terms such as anchorite, brewing, or chaste marriage which may be useful as you read. After reading and reflecting on The Book of Margery Kempe, this week you will have the unique opportunity to see an interview with the author. Her story was first transcribed by a priest, then lost for almost 500 years, before reappearing in 1934 to be recognized and reinterpreted by secular critics. Now, after a long meditative silence, Ms. Kempe has decided to go back on the record to respond to charges of indecency, heresy, and lunacy. Don’t miss this exclusive interview hosted by Dr. Bill Rankin. This interview is based on a live chat Margery held with ACU Online students several years ago. If you have trouble with the video, you’ll find a transcript of that event below. Margery Kempe and the Wife of Bath are far from typical women for their time; however, to understand how each stands apart from the assumptions and expectations about gender most medieval readers brought with them we need to learn something about the life of representative women, highborn and lowborn, living in the world or withdrawn from it. Spend 15-20 minutes reading about Medieval Women at the interactive site hosted by McMaster University. As you follow the travels of young Christine, you will learn about the opportunities and barriers that women encountered in the Nunnery and the World. Take notes on anything that might inform our reading of the “Wife of Bath's Tale”, including details on work, education, marriage, or the life-cycle of women, before class. At the end of the Pardoner's portrait in the “General Prologue,” Chaucer calls him a “noble ecclesiaste.” Whatever else readers think of him, most surely recognize the personality of an impressive churchman or preacher. The Pardoner's actual “Tale” ends like any good sermon with the rioters’ fate underscoring the main text: “the love of money is the root of all evil.” But neither the sermon nor the tale is over. Listen to the following reading of the Pardoner's final words and how it presents the clergy. Robert Tilton regularly taught that poverty was a result of sin. Tilton's ministry revolved around the practice of making “vows,” financial commitments to Tilton's ministry. When a person made a vow to Tilton (Tilton's preferred “vow,” stressed frequently during his broadcasts, was $1,000), Tilton preached that God would recognize the vow and reward the donor with vast material riches . . .
One of Tilton's most frequent sermon topics was the Biblical story of Elijah and the widow of Zarephath (I Kings 17:8-16). In the story, Elijah comes to a widow who is almost out of food and asks her to prepare him a meal. She replies that she has only enough food for one last meal for herself and her son. Elijah asks her to prepare him a meal first and then promises that God will not let her food be exhausted. In faith she does so, and her food supply indeed does not run out. Tilton regularly used this story in the context of asking viewers to send money to his ministry. Here are the images we looked at in class today. Thanks for your discussion and energetic speculation in class. I’ve really enjoyed our group this semester and your willingness to jump in. Remember to read back through the Parson and the Pardoner’s portraits in the General Prologue before our reading of the Pardoner’s Tale next time. See you Wed.